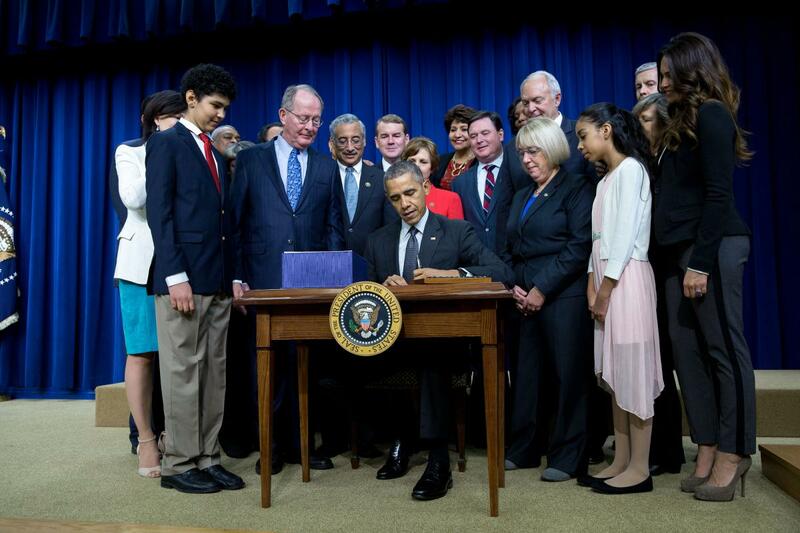 The Every Student Succeeds Act (ESSA) became law on 10 December 2015. ESSA reauthorizes the Elementary and Secondary Education Act (ESEA) and includes a substantial rewrite of the No Child Left Behind (NCLB) Act. The new law also aims to strengthen federal support of science, technology, engineering, and mathematics (STEM) education; FYI: The AIP Bulletin of Science Policy News discusses the STEM education highlights in their article "New 'No Child Left Behind' Aims to Strengthen K-12 STEM Education." Annual statewide assessments are still included in the law, but the responsibility of determining student performance goals and providing support for the schools that need it lies with the states. ESSA retains the NCLB requirements requiring testing in science and mathematics. The performance goals should be such that high-school graduates are prepared for "success in college and the workforce." Mathematics, science, and computer science are listed as core academic subjects that are required for a "well-rounded education." State-funded preschool programs will be established or expanded using the Preschool Development Grants program. A new grants program will be established to help states close the achievement gap. Incentives for teacher training and continuing education programs will be expanded. New programs like the STEM Master Teacher Corps will help "recognize, reward, attract, and retain outstanding STEM teachers." Schools will be allowed to partner with higher-education institutions for professional development. Grant funding will be provided for states to use on professional development and instruction materials for STEM teachers. Local resources will be refocused to support students from early learning through college. Grant funding will be provided for states to use on STEM education engagement, e.g., courses, afterschool programs, and STEM-focused specialty schools. This information is summarized from Every Student Succeeds Act (ESSA) text, the Department of Education's pages on the Elementary and Secondary Education Act (ESEA), and the FYI article "New 'No Child Left Behind' Aims to Strengthen K-12 STEM Education."